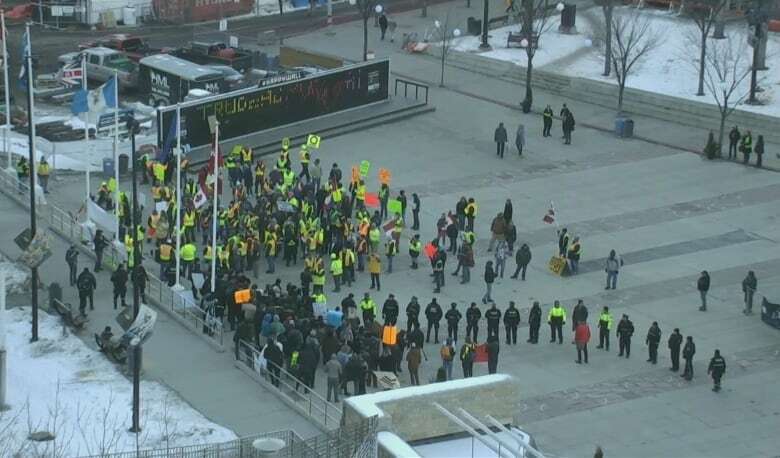 A fistfight broke out during a rally in downtown Edmonton Saturday afternoon before police moved in to separate protesters and counter-demonstrators. A fist fight broke out during a tension-filled rally in downtown Edmonton Saturday before police moved in to separate protesters and counter-demonstrators. The rally marked the second consecutive weekend in Edmonton that protesters spoke out against Canada's plan to endorse the United Nations' migration pact. Last weekend's protest was peaceful, unlike Saturday's, where a few people ended up in handcuffs. Some protesters had other concerns, ranging from the pipeline debate to the controversial carbon tax, Alberta independence and even photo radar. But the rally turned violent when protesters clashed on immigration issues. Only a few police officers were in Churchill Square when the altercation started but more arrived after the first punch landed. About 20 officers formed a line to separate two groups totalling about 150 people. People on both sides wore yellow work vests, like demonstrators in France participating in ongoing protests against that country's high cost of living. "Trudeau isn't supporting Canadians anymore," said demonstrator Taylor Mansfield. "He's supporting immigration too much. Our jobs are going away, I find. I'm in the construction industry, I'm having a hard time getting work. "I know all these people are coming here and they're newcomers and they have to work for cheap but they're putting me out of business." Mansfield also complained about the carbon tax and other "big taxes." He said he wore a yellow vest in support of the yellow-vest movement in France. The U.N. now has "full authority of what happens to Canada now, who comes here, who doesn't come here," he said. Asked what message he wanted to send the federal government, he said: "Stop bringing people here that don't want to assimilate into Canada. Stop bringing people here that want to [do] harm to us. Stop bringing people here that don't like our Christianity values, our Western values. "If you come to our country, fit in." Counter protester Adebayo Katiiti vehemently disagrees with the anti-immigration argument. "They don't know our stories. They're like 'Oh, go back where you're coming from.' That's white privilege," said Katiiti, who is originally from Uganda. "Racism is dangerous, and it's what they're representing." This story has been amended to reflect that protesters at Saturday's rally expressed concerns about a wide variety of issues.